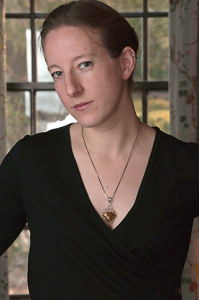 This is another in the series of interviews with members of “The Bridge Fiction Workshop” that I started back 2010, and which now runs under its own steam in Narberth, PA. Alison-Campbell Wise (who writes as “A.C. Wise”) was in the very first incarnation of the workshop and submitted some of the more interesting fantasy works we read and critiqued. It’s no surprise to me then that she now has a collection of stories—comprising something akin to a braided novel—about to debut. It was something of a surprise to find that the stories include drink recipes, and it’s with that bit of trivia we begin. Your collection of short stories, The Ultra Fabulous Glitter Squadron Saves the World Again, comes out in October from Lethe Press. I understand there are beverage recipes? There are indeed! One of the members of the Glitter Squadron, Sapphire, aspires to open her own bar someday – provided she isn’t too busy saving the world, of course. In order to practice her mixology skills, she’s designed signature cocktails for each of the members of the Squadron. The stories in the collection are interspersed with these recipes, which also provide insight into how Sapphire sees the other members of the Squadron, and how she sees herself. Sapphire (with a little help from me) has also been designing personalized recipes for folks who preorder the collection. It’s been a lot of fun. Tell me a little about the collection. Are these connected stories in some way? It all started with “Dr. Blood and the Ultra Fabulous Glitter Squadron” (which I’ll talk about a bit more below), which was published at Ideomancer. Originally, I thought it would be a one-off thing, a lot of fun to write, but certainly not anything that would expand into a whole universe. However, it turns out the fabulous, glittery ladies of the Squadron had a lot more to say. Two of the stories in the collection are reprints, and the rest are originals. The collection is book-ended by adventures featuring the whole crew, and the stories in-between explore various aspects of the individual members. Some are origin stories, and some are solo side missions. The stories are all connected, but they’re all meant to stand alone and be relatively self-contained as well. Who is Bunny? And who is Dr. Blood? What kinds of danger does the Squadron encounter? Bunny is the fearless leader of the Ultra Fabulous Glitter Squadron. Her preferred battle attire is typically a silver mini-dress. Her chosen weapon is a custom-made harpoon or, in a pinch, the pair of high heels she currently happens to be wearing. She is fierce and fabulous and never without her trademark bunny ears, perched atop her bouffant hair-do. In terms of the order the stories were written, Dr. Blood is the first nemesis the Glitter Squadron faced off against, but in terms of the in-universe timeline, they encounter him fairly late. He threatens the destruction of earth from his elaborate fortress on Mars, as one does, when one is a scientist/super-villain, and it’s up to the Glitter Squadron to stop him. As you may have gathered, the Glitter Squadron isn’t exactly a gritty, realistic crime drama. Their foes tend to be space eels and sirens and other supernatural creatures. At the same time, the collection isn’t solely camp. It touches on gender, family, friendship, queerness, and all those lovely, messy details that are part and parcel of life. How long have you been writing short stories and when did the UFGS first tickle the back of your brain? It’s a cliche answer, but I’ve been writing short stories since I learned how to write. As proof, I have a binder full of fully-illustrated ‘stories’ typed on my parents old word processor from when I was around 4 or 5. They’re mostly about mice, and the spelling is quite…creative. Luckily, I’ve mostly outgrown the tendency to spell words that look like they would only be fit as part of an incantation to summon the Old Ones. I’ve been publishing professionally since 2004, but I still tend to think of myself as a beginner. I’m still learning! l acquaintance, Jonathan Maberry. The story didn’t make the cut for the anthology, but it did find a good home eventually. From there, the members of the Glitter Squadron began lining up and politely, or not so politely, demanding my attention and asking for their stories to be told. What’s your favorite way to start a story? My favorite way to start a story is to have the first line pop into my head fully formed, and for the rest of the story to effortlessly fall in line from there. Alas, that is rarely the way it happens. Revision: love or hate it? Hate it with a passion hotter than a thousand burning suns. Why can’t the damned story just do what it’s supposed to the first time around? Ultimately, I like to think the editing process gets me to a better place in the end, but while the revisions are happening, I am frequently tempted to throw my laptop out the window, set it on fire, and swear off writing forever. This temptation occurs roughly every five minutes. Sometimes there is literal swearing involved. Usually I find a way through somehow; for the most part, no laptops are harmed during this process. If you had to compare The Ultra Fabulous Glitter Squadron Saves the World Again, what would you compare it to? Animal, vegetable, or mineral?Something sparkly. I’m thinking a hippogriff dipped in sequins. You also co-edited Unlikely Story for many years. How has your experience as an editor changed over time? Has it influenced your writing? Do you hope to revive the anthology? Unlikely Story has gone through many changes over the years. It started life as The Journal of Unlikely Entomology, a very narrowly-focused publication featuring fiction about bugs. From there, we expanded to include other themes – architecture, cartography, academia – and grew to a pro-paying market. This year, we’re publishing our first print anthology, Clowns: The Unlikely Coulrophobia Remix, featuring flash fiction stories about clowns. Alas, time and financial constraints won’t allow us to continue publishing regularly anymore. We had been doing three full issues per year, plus the occasional flash fiction mini-issue. We’re hoping to do more one-off anthology projects down the road, but those will likely be Kickstarter projects, and it may be a while before our respective life and work schedules have enough space to make such a thing feasible. Co-editing Unlikely Story has been an amazing experience. It’s taught me to have more patience as a writer, and it’s really driven home the point that rejection isn’t personal. We’ve had to pass on stories we loved because they didn’t fit our theme closely enough, or they were too similar to something we’d already published. So much of it is right editor, right time. The best part of working on Unlikely Story has been getting to know so many incredible authors. Some were people whose works I’d previously admired and was delighted to have the opportunity to publish, others were new-to-me and working with them turned me into an avid fan of their work. It’s always a great feeling when an author makes their first sale or first pro sale to your publication. You’re the first to discover something new and wonderful, and you can’t wait to share it with the world. I’ve met a few of our authors at conventions, and now consider some of them friends. That might never have happened without that first moment of ‘hey we published your work and now you’re a real person here in real life hooray’ to spark the initial conversation. You write a fantastic monthly column for SF Signal, called “Women To Read.” How did that column get its start? How much reading do you do to prepare? The column was sparked by Kari Sperring’s #womentoread hashtag on Twitter. I wanted to take it one step farther, and recommend a specific starting point for each woman’s work. Luckily, I tend to read a lot anyway, so most of the reading for the column comes out of that. I do like to feature different women with each column, and get a mix of newer and more established authors. It’s been a great incentive to seek out work I’m not familiar with; I’ve made a lot of great discoveries that way! Where can we find you and our copies of The Ultra Fabulous Glitter Squadron Save the World Again? You can find my sporadically updated blog at www.acwise.net; you can find my Women to Read column at www.sfsignal.com; and you can find me on Twitter as @ac_wise (warning, may contain excessive corgi pictures). 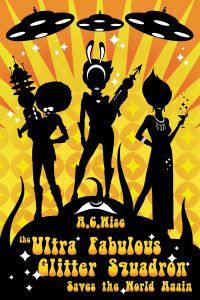 The Ultra Fabulous Glitter Squadron Saves the World Again is currently available for preorder from Lethe Press. As of October 20th, it will officially be out in the world and hopefully making its way into a few independent bookstores, as well as online retailers like Amazon.